Merce Cunningham said that writing about dance can be like pinning down jell-o. These critics prove that some jell-o is slipperier than others. In 1957, Louis Horst wrote a piece for the Dance Observer of Paul Taylor’s 7 New Dances. It was a deconstructed dance using not only everyday gestures and repetition, but also absolute stillness. In one section, the curtain went up on Taylor standing and a young woman sitting. After four minutes of this frozen posture, the curtain came down. Horst’s review began by stating that Paul Taylor performed at the 92nd Street Y, followed by blank space and his signature at the bottom of the page. The review made Taylor famous and infamous in the then tiny world of modern dance. In 1994, noted dance critic for the New Yorker, Arlene Croce, wrote “Discussing the Undiscussable,” the now notorious and controversial essay in which she announced that she was boycotting Bill T. Jones’ Still/Here, a piece of performance art about real people suffering from terminal illnesses, in the belief that the advent of ”victim art” would eventually prove disastrous for art in general and dance in particular: “I can live with the flabby, the feeble, the scoliotic. But with the righteous I cannot function at all. Instead of compassion, these performers induce, and even invite, a cozy kind of complicity.” Because it was an expression of “victim art,” she considered it impossible to review “by putting dying people into his act, Jones is putting himself beyond the reach of criticism… I can’t review someone I feel sorry or hopeless about.” Jones responded by saying that Croce was narrow minded and ill informed. The work went on to become one of Jones’ greatest successes. Tere O’Connor became a controversial figure (among critics) and a hero (among dancers) for having written an impassioned, angry unpublished but widely circulated letter to the New Yorker in August 2005 in response to a fairly positive review “Mystery Theater: Downtown surrealists” of one of his dances by Joan Acocella in which she labeled four NYC choreographers “downtown surrealists.” O’Connor, finding the comparison “intellectually porous,” referred to Acocella and other dance critics as “literalists” and out of touch. In light of challenging economic times for dance makers and critics alike, now might be the time for mutual advocacy and a really juicy controversy. This article previously appeared on the bathroom stalls of ODC, as part of the Bathroom Education Program. Phoenicia Pettyjohn is the Director of Bathroom Education at ODC. Conceived as a program that broadens dance education at ODC, “Bath Ed” includes short educational pieces posted inside the bathroom stalls that Pettyjohn researches and writes on a weekly basis. Happy to research and skulk around the bathroom stalls, Pettyjohn took over the project as a volunteer in 2006. Describing herself as “something of a dance nerd,” she has a personal dance library rivaling most institutions. For her, the search for more information is inspiring and challenging. Even more challenging is how to write an educational and hopefully entertaining piece for the wide variety of people and ages at the Commons. To date, she has written over 120 pieces on anything and everything from Gumboot to Parkour and Black Mountain College to American Bandstand. Ideas come from brainstorming in the school office, watching late night television, things she has always wanted to know more about, and amazing suggestions from the Commons students and staff. Click here to access the Bath Ed archives. Insofar as I respond to the aesthetic in sport, it is moments of grace…. that I respond to, moments or movements…. when everything goes right, everything clicks into place, when the lookers-on don’t even want to applaud, just to give silent thanks that they were there as witnesses. In the studio on Divisadero Street, on a chilly Sunday last November, choreographer Scott Wells and his dancers are rehearsing the why ask why we dance dance, a piece that the company will present in January 2015 at ODC Theater. With its title part Dr. Seuss, part Haruki Murakami (2), the dance points to the humor that permeates Wells’ work. It also indicates a questioning around the making of dance, and leads to further questions: What kinds of practices are Wells’ dances rooted in? What are the aesthetic threads that run through his work? Watching Wells’ pieces over the past 14 years, one could say that they are gravity defying and highly physical, informed by contact improvisation and weaving a unique relationship with their performative environment. Some of Wells’ work, created solely for men, also exposes the many layers of masculinity, often with touches of grace and humor. For about 15 years, Wells went to a contact improvisation jam every week “to let go but also for exploration, to see what the bodies were doing,” he recently shared. “To me, it’s part of my style, although 95% of the time there is no contact improvisation happening on stage.” The movement inquiry initiated by Paxton has given Wells a landscape on which to draw and create new kinetic possibilities. In rehearsal, dancers explore a partnering phrase, allowing it to evolve into an athletic duet, with the ease and flow typical of contact improvisation. Wells’ interest in football as a child, and particularly the moments when players “dive into somebody and tackle,” as he mentions, also informed his process and added to his movement palette. 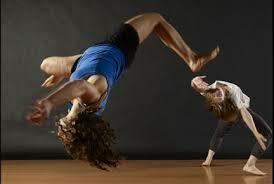 “When I look at dance, I yearn for the moment where you see release in the space. When gymnasts spin around the high bar, the moment they let go is the moment that I love,” Wells continues. Acrobatic movements, including cartwheels, back flips and handstands, make their way into Wells’ syntax, momentarily taking the performers upside down and providing his dances with gravity-defying and risk-taking moves. In all his pieces, dancers seem to fly off the ground, launching their bodies high up in the air to bounce off a wall in Parkour (2011) or to land on the shoulders of a standing fellow performer in Call of the Wild (2009). In his work, Wells explores the possibilities of what the body can do with and within a specific environment. Wells’ performers have a unique way to interact with their surroundings, whether it is the theater stage or props that are part of the set. Wells’ Parkour, inspired by the training discipline of the same name, is probably the best example. Developed in France in the late sixties, parkour utilizes movements from military obstacle course training “using only the human body and the surroundings for propulsion, with a focus on maintaining as much momentum as possible while still remaining safe. Parkour can include obstacle courses, running, climbing, swinging, vaulting, rolling.” In Parkour, Wells borrows from the urban movement vocabulary of the French course and applies it to the stage, which is populated with different obstacles in the form of gym mats of all shapes and colors. At times, performers come from all sides of the stage, creating a frenzy of bodies jumping, swinging, rolling, balancing on and over the props at a dazzling pace with great control. Manipulated by the performers, objects take a life of their own. They can kill a bravado, such as when a large gym mat falls over a dancer in Parkour, just after she has performed a balancing feat. In the same piece, one of the female performers pushes a mat down. It falls on the floor with a big thud, prompting the fall of a performer walking away from it, reminiscent of a deck of falling cards. One could say that Wells is also influenced by the surf culture of the West coast. It is certainly apparent in One Fell Swoop: The Art of Skateboarding (2000), where dancers and skateboarders share the stage. “I love their bodies when they are skateboarding,” Wells comments about the skateboarders, “they are so relaxed, aware and able.” The defiance of gravity and risk-taking commonly practiced by skateboarders are equally applied by Wells’ dancers who dive off walls and props with fluid grace and ease. In Call of the Wild (2009), men run up and against the back wall, using it momentarily as a vertical floor, recalling the ease and mastery with which surfers attack waves. Similarly, Wells’ pieces somehow absorb the Western archetype of exploring the last frontier and pushing the boundaries of space. In Parkour, performers use the wall for support of a handstand. In his West (Side) Story (2008), dancers sit at the edge of the stage, moving in and out of the space between audience and stage, using that edge as a springboard for jumps. In Gym Mystics (2007), dancers push against the theater walls and use them as a springboard for a somersault. Later in the piece, dancer Andrew Ward walks on beams put together as a moving staircase by his fellow performers, until he is high enough to reach the space above the stage, where the lights reside, and disappear into the dark space. Carving new niches within space is also seen in how Wells’ dances often vibrate within a median space. Where ballet traditionally occupied the upper realms, away from gravity, and modern dance revered the connection to the floor, Wells’ pieces often seem to claim a place in between, such as when Rajendra Serber jumps horizontally over a beam in Ball-is-tic (2010) or Sebastian Grubb flies over a fellow performer in West (Side) Story. Similarly, in Call of the Wild, a performer springs in a perfect low horizontal line over four seated performers, and rolls off stage. With some pieces created solely for male performers, Wells’ dances also offer a unique lens into the universe of men. They navigate the different stages of fatherhood in Father On; cultivate skills and body tone in Gym Mystics; converge on a field of sport in Ball-is-tic; negotiate the thin edge between softness and roughness in Rocky vs. Baryshnikov (2002). In these pieces, Wells highlights how men’s juvenile nature can suddenly burst to the surface of adulthood given the right environment. In Ball-is-tic, serious-looking performers dressed in black suits walk and cross paths without acknowledging one another. The lighting is quite dark; the soundtrack is a Hungarian song and one imagines the men walking on the plaza, a common place of male sociability in Eastern European countries, where Wells has taught and lived. A bright red ball suddenly bounces onto the stage, interrupting the stern visual rhythm that the men’s walk had previously set. A quick succession of additional balls follows, creating a sudden cacophony of colors and forms, the stage transforming into a playground in which the dancers shed their seriousness and begin to play catch, hooting and hollering as if the men had been returned to boys. The feeling of wild play reoccurs in other pieces, such as in Father On when the all-male cast throws a baby doll – a stand-in for the real McCoy – at each other, pretending it is a ball. Ball games nurture camaraderie and brotherhood among men, which is another aspect that Wells highlights in his dances. In Ball-is-tic, the performers come to lay down on top of each other, resting a head on one another’s belly or shoulder, closing their eyes for a moment, reminiscent of a pack of wolves taking shelter in each other’s warmth. Choosing to choreograph for an all-male cast does not arise from a need to create more interesting roles for men than the ones traditionally imparted to male dancers, but rather from a personal curiosity in accessing and exposing aspects of masculinity that are not necessarily highlighted on stage. “I never went through that classical or mainstream training of supporting the women. I was in a very liberal college where people made odd experimental things. I made men duets and enjoyed that. There was a little level of provocation to have two men holding hands. It also strikes home because I have two older brothers. I loved that physical play when I was young and I really missed it when I was a teenager, when I became shy or my brothers and I didn’t touch anymore.” explained Wells. With his all-male casts, Wells offers his insights on the world of men with an authenticity that recalls the refreshing simplicity of director Richard Linklater’s Boyhood. In the film, Linklater exposes the many phases of a boy growing into a man in a narrative where “the event is the non-event,” as actor Ethan Hawke comments. This musical patchwork allows Wells the possibility to veer away from rigidity of both form and content. He also relies on humor to break the rhythm or take a scene in an unexpected direction. His pieces poke fun at human tendencies for grandiosity and self-importance. In Ball-is-tic, three men compete for the spotlight and push each other off the beam on which they are trying to accomplish a little ballet solo. The opera voice of tenor Caruso in the background, with its lyrical and dramatic undertone, accentuates the ridicule of the performers. Later on, a performer completes a short solo when he is suddenly interrupted, and literally knocked down, by a large gym mat thrown at him. In Home, a performer jumps out from behind the couch, as if from nowhere, and bounces up and down on the upholstery, his body flat, with surprising effects –corn kernels popping up in a frying pan. Wells’ dances contain references to ballet – men accomplishing port de bras with a puffed out chest and a stern gaze in Gym Mystics; performers with a hand on the gym mat as a pretend barre, going through their pliés as one performer leads the ballet class in French in Parkour. These moments are often conveyed with a humorous tone, a possible commentary on how ballet and other codified techniques can appear rigid and an obstruction to the freedom of the body that Wells so adamantly espouses. Other cultural references lead to hilarious moments and destabilize the trajectory of a scene, taking the dance in an unexpected direction. In both Parkour and Gym Mystics, a performer breaks into an imaginary guitar solo. In Gym Mystics, the male performer, a bandana across the forehead, uses a beam as a stand-in guitar, and lets it loose, joining along the Hendrix guitar solo that is playing in the background. Similarly, in Call of the Wild, Ball-is-tic and Gym Mystics, a performer suddenly breaks into a Bruce Lee imitation, brandishing an imaginary sword, swinging one leg up, kung fu style, and yelling monosyllables. “Part of a dance can seem precious and I want to hear someone scream. That comes from the world of contact [improvisation]. What is it that we think we are not supposed to do on stage? Consider that as an option,” Wells comments. At moments, Wells manipulates the body so that it appears as a malleable toy; held by their feet by a dancer lying on the floor, two dancers stand facing each other, about 5 feet away from each other, in Ball-is-tic. They lean forward, as one piece of cardboard, one line from head to heel, reminiscent of puppet figures. Again, in one scene of West (Side) Story, the lighting casts the performers’ silhouettes on the backdrop, and their bodies become a fantastical shadow play. The humor and its offbeat results contribute to dances that are “free of fussy auteurist gestures and self-conscious grandiosity” to borrow film critic Ann Hornaday’s words. They also differentiate Wells from choreographers who incorporate acrobats or gymnasts in their pieces, such as the San Francisco-based company Capacitor or the New York-based choreographer Elizabeth Streb, whose dances have more of a presentational aspect and create a somehow “super-body” – one capable of many feats and contortions, seemingly devoid of human flaws. 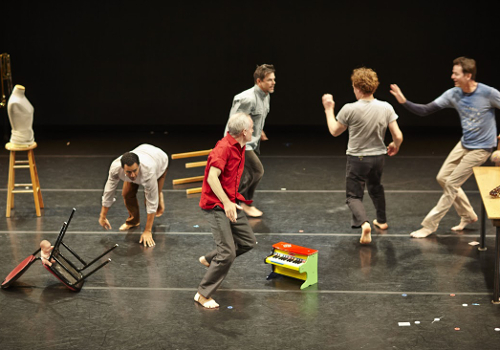 By using humor and integrating those acrobatic movements within the choreographic phrasing – to build momentum toward an encounter or to shape a section- Wells moves away from their sensational qualities. In Wells’ choreography, the stage becomes explosive, with bodies springing in space from all directions, with audacity and buoyancy. His tendency to scavenge from quotidian events such as a simple walk, an encounter, a ball game, and infuse them with grace and humor is both immediate and subtle. Wells’ dances do not shy away from the absurd – an acrobat at the top of his physique can get toppled over by a gym mattress like a bug crushed under a giant hand; ludicrous falls often follow a heroic jump, thereby speaking to both the inevitable flaws and strengths of human nature. Quite often when watching Wells’ work, the combination of risk, elegance and humor makes us not even want to applaud, just give silent thanks that we were there as witnesses. (2) Dance, Dance, Dance anyone? A man and a woman take the stage. Beyond the physical space that separates them, exists the gap of a generation. How do these two individuals relate to each other? What transpires from their connection? Does their performance style comment on two different moments in dance history? And as viewers, what do we project on their relationship? Orthopädie or not, performed this coming Saturday at ODC by Swiss artists Meret Schlegel and Kilian Haselbeck, raises some of these issues. Schlegel, Haselbeck and I sat together to talk about their collaboration as choreographers and performers. Marie Tollon: How did you two meet? Meret Schlegel: I was working at the Tanzhaus in Zurich when I saw Kilian in a piece by Philippe Saire, and noticed his very strong presence. Shortly after, I invited him to do a residency. A year later, my successor at Tanzhaus came up with the idea that the dancers who were part of the beginning of the contemporary scene in Zurich should be visible again. She wanted to showcase younger and older artists in the same program, with each presenting 10 minutes of work. I thought that if this project is about generation, I would want to collaborate and create new work with somebody younger and different than me. I asked Kilian if he was interested. We talked about the piece and started working on it. We first performed a short piece in January 2012. We continued to work together and premiered its longer version [the one to be shown at ODC] in March 2013. MT: As two different generations come together on stage, this piece highlights differences in style, language and movement quality. What did you each learn in this conversation? MS: I’m not as strong and as fast [as Kilian], and dancing with him led me to ask the question: “Where is my strength?” I realized that power and strength can come through presence, not just through muscle strength. Kilian Hazelbeck: This piece encouraged me to slow down, to take my time, and also to realize and be confronted with what will happen when I get older. When older, you need much more time to learn new material, your eyes need more time to adjust to light changes, etc. MT: What were the important questions that this piece raised for you? MS: The main question was “How close can you get when you meet someone, and what comes out of it?” We were always clear that the piece was not about defining the relationship between us, that we leave this open for the viewers to define it themselves. It isn’t a piece about the social/sexual parameters which are so strongly embedded in our society. It is about the meeting of two dancer personalities with different movement qualities. 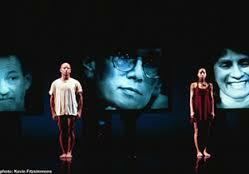 MT: How was the choreographic material generated? MS: For me, this piece was about taking risks and being curious. “What happens with me when I get challenged by him, but stay present?” So it wasn’t about saying to myself that I’m too old and I can’t do this [particular scene]. I was preoccupied with the change of my skin, which I can’t do anything about. KH: We had no music for most of the creative process. It only came in the last week. I researched music and a song in the soundtrack of Tarantino’s Django Unchained caught my attention. Musician Matthias Frommelt sampled the song and we used it at some point in the piece. MT: What was the role of dramaturge Nicole Gabriele Schöpfer? MS: She helped us put the different pieces together, always pointing back to our first ideas. It was important to have an outside eye who helped us transition our first short piece into a full piece. MT: What artists have influenced you? KH: Michael Jackson! I saw him perform and dance when I was 10 years old and I wanted to do the same! MS: I loved watching ballet but it felt like it had nothing to do with me. My approach to dance was through visual arts and music. I was dancing in the museums as a kid, because of their big open space. I came to San Francisco in the seventies and was highly influenced by the spirit of collaboration and performance art. MT: This piece is also about two different generations of dancers. What do you feel has changed between the time you Meret, started to dance and now? MS: I feel that dance has opened up. Those dance forms considered marginal, such as street dance, are now influencing contemporary choreographers. No longer are you just a ballet dancer or just a modern dancer. You have to be all of it. KH: …and a performer, and an actor, and a musician and a thinker too!